For those who call Nappanee home, this site will provide you with valuable information and links to services and resources within your city. For those who are passing through or thinking of visiting, we hope you find the information useful, and that it will give you some great reasons to stay a little longer! Nappanee is blessed to have diverse businesses, outstanding schools, safe neighborhoods, nurturing churches, and scenic parks. However, it is our caring and compassionate citizens who make Nappanee so incredible. Taking pride in the community, our residents work together, continually looking for ways to improve. Our public safety team (police, fire, and EMS) selflessly protect and serve the community. Our Parks and Recreation Department, Street Department, and Utility Department are made up of dedicated employees who deliver professional service. Our Planning and Zoning Department assists developers and contractors who desire to improve our built environment. And our Senior Center, also known as Elder Haus, provides transportation, meals, and activities for Nappanee’s retired residents. Nappanee is also proud to partner with our schools, library, Boys and Girls Club, Family Christian Development Center, chamber of commerce, and local service clubs to provide the best place to live, learn, work, and play. We invite you to join our festivities: Second Saturdays, frequent events at Amish Acres, the annual Apple Festival, our Fourth of July celebration, and NorthWood High School athletic events and fine arts performances. Take time to visit our downtown, where you will find many unique shops, small businesses, and delightful eateries. Just a few blocks east of downtown is historic Coppes Commons, the former cabinet company that has been converted into a gathering place for shopping, eating, and entertaining. If you want to know more about the history of our community, visit the Nappanee Center, where you will find interesting stories and intriguing artifacts from our past. You can also stay active on our bike trail, golf course, softball complex, soccer complex, playgrounds, sledding hill, wetlands, and dog park. 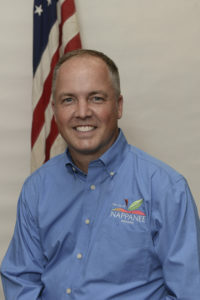 We want to hear how we can work together to make Nappanee even better. If you have questions or comments, please feel free to call, write, e-mail, or stop by the office, located at 300 West Lincoln Street in Nappanee.